From the moment doors open to the final minute of an event, when our partners are entertaining the masses, we are right there with them. The Bright Pursuit offers the ultimate live event accompaniment, from quality merchandise to personable & experienced staff and increased profits, ensuring the best possible experience for both clients and audiences. Building merch lines, full production capability, tracking sales and stock levels with state of the art POS systems on site, artist advances/settlements, and easy to read reporting. Our dedicated team will monitor your project 24/7, wherever and whenever your touring or traveling events hit the calendar, ensuring deadlines are met. We prepare vending plans for each date and use our resources to advance POS sales and production requirements with venues to maximize your sales each and every time. Engaging consumers with on-site DIY stations allows brands to reach their audience in a fun, different way. We activate on-site, interacting 1-on-1 with fans as they approach the experience. Fans pick their items and customization, then leave with their own unique piece in hand. Operating on both coasts, out of some of the largest and most efficient production facilities in the country, we turn creativity and ideas into visually and physically stunning products. We employ the latest techniques to produce the on-trend styles that your project needs, while our full-service finishing department provides white glove service to add tags, labeling, custom packaging, cut & sew garments, and much more. 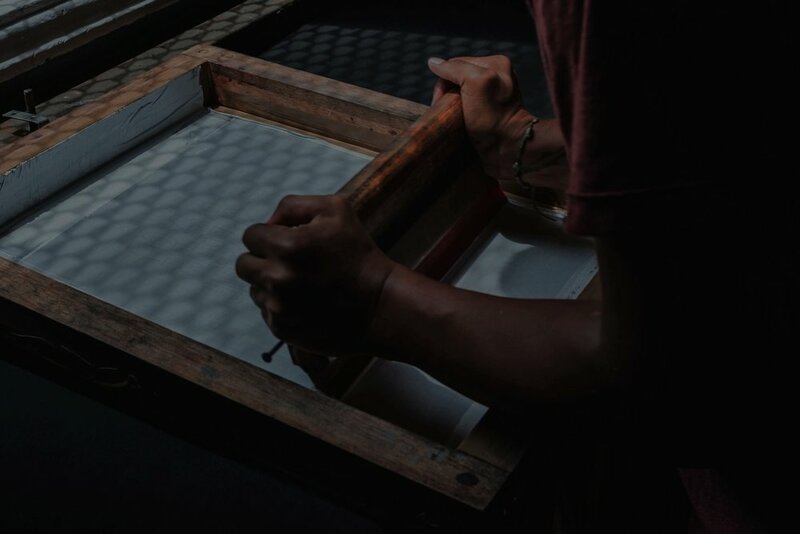 With automatic & manual presses, specialty presses, direct to garment capabilities, embroidery machines, a dye and embellishment house, and more... we operate within some of the largest production facilities across the country, producing thousands of pieces per day. We employ the latest production techniques to produce the on-trend styles you need, with quality control from top to bottom. Both domestically & internationally, the possibilities are endless. From custom cut & sew apparel to any accessory or branded premium item you can dream up... we have and will continue to make it happen. Available services include custom size/style tags, woven/printed labels, hangtags, foil, glow in the dark & reflective prints, custom packaging, premium athletic finishes, and much more. Our team of creative artists will manage the entire process, from idea phase to production. We can start from scratch on designs to make your project stand out, or we can turn your ideas into eye catching designs. Either way, we perform a deep dive into your brand identity to ensure we align with designs and color schemes. We manage your digital assets throughout the entire production process and handle all art prep & separations for production as well. With us, expectations are everything. It is our obligation to provide honest, comprehensive, no-cost consultations. Every consultation will be led by our Founder and CEO, Evan Blaire to ensure your project is a priority. During your consultation, our team will provide you with pricing for your project that will allow you the opportunity to review your options and make the best decision for your brand and budget. Fill out the form to start your next project with The Bright Pursuit.